No domestic flights: While many tours through Turkey would include flights between some of the longer stretches, we remain environmentally sensitive with all travel maintained through the use of coaches, buses and even boats! This doesn't mean that your comfort is jeopardised - travelling will be relaxing with a greener footprint. Dollar-a-day program: You are given the opportunity to give back to people visited on our tours through our Dollar A Day system. Simply give a one dollar donation per day in Turkey and 100% of this will go towards conservation projects worldwide through our foundation. Cappadocia family stay: In order to better educate our travellers about the local community, you are invited to travel to a local village and enjoy dinner. You will learn about the history and conservation of the Cappadocia area and how not to damage this beautiful region through tourism. 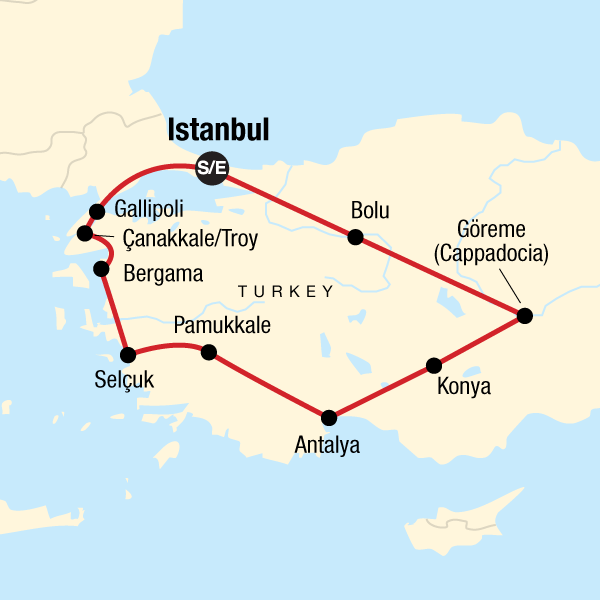 Gallipoli: This tour includes a visit to the poignant site of Gallipoli where thousands lost their lives during the Second World War. Through trips to ANZAC Cove, war cemeteries and Lone Pine, you will learn about the devastating death toll inflicted on both sides, and the impact this had on events across the globe. Small Group Tours: With an average of 10 travellers on every trip, we ensure that local communities do not feel the impact of a tour group in their vicinity. We continually educate our tour groups on the culture and heritage of local people and this allows the area to reap the benefits of tourism without changing the local way of life.